Small to medium sized evergreen with small leaves. 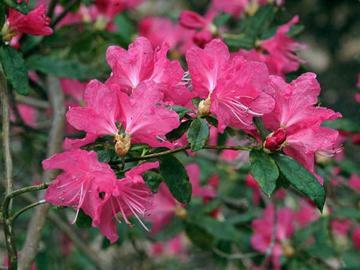 Early flowering with attractive rosy-pink flowers in March or April. Moist, well drained humus rich acid soil in part shade and a sheltered position..
"Ostara" is the pagan spring equinox festival, celibrating new growth, birth, fertility and the sowing of seeds, adapted by Christian tradition to become Easter.